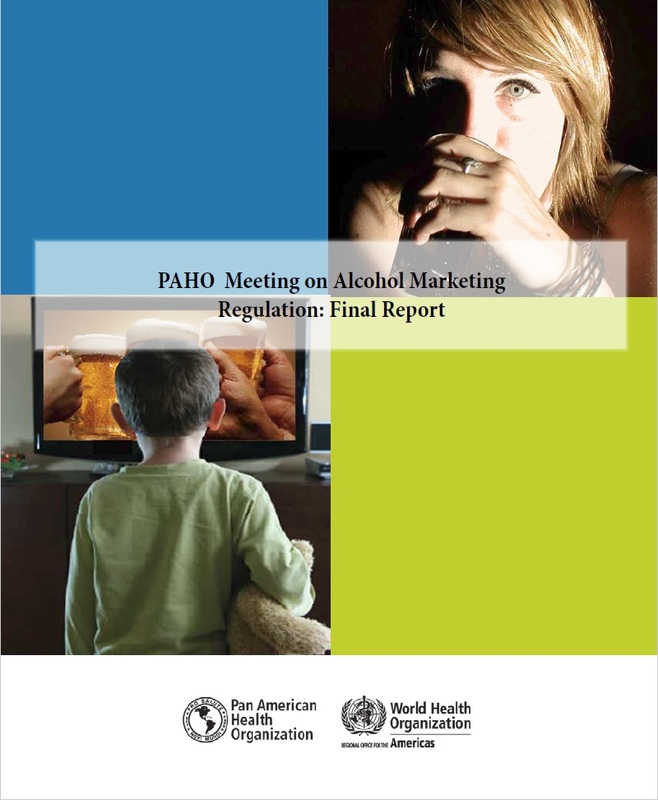 The Pan American Health Organization (PAHO) organized an expert meeting last year to review alcohol marketing regulations in the Americas and worldwide and to consider frameworks for assisting Member States. The meeting summarized research on the effects of alcohol marketing on young people; reviewed existing statutory and self-regulatory codes on marketing and examine their effectiveness; considered the implications of international trade agreements and other treaties for developing a global alcohol marketing code; and described the experience of countries where alcohol marketing legislation has been recently enacted or proposed. The Global status report on alcohol and health 2014 presents a comprehensive perspective on the global, regional and country consumption of alcohol, patterns of drinking, health consequences and policy responses in Member States. It represents a continuing effort by the World Health Organization (WHO) to support Member States in collecting information in order to assist them in their efforts to reduce the harmful use of alcohol, and its health and social consequences. The report was launched in Geneva on Monday 12 May 2014 during the second meeting of the global network of WHO national counterparts for implementation of the global strategy to reduce the harmful use of alcohol. Download the report without country profiles here. View the country profiles by name here. The international public health community responds to the global alcohol producers’ attempts to implement the WHO Global Strategy on the Harmful Use of Alcohol. The purpose of this guide is to assist government agencies and ministries in developing country-level legislation to implement, monitor and enforce effective alcohol policies. The need for this guide was identified by countries in the WHO Western Pacific Region who, after developing their Regional Strategy to Reduce Alcohol-Related Harm recognised that there was also a need to provide countries with guidance on how to develop legislation to implement the strategy. The Global status report on alcohol and health (2011) presents a comprehensive perspective on the global, regional and country consumption of alcohol, patterns of drinking, health consequences and policy responses in Member States. It represents a continuing effort by the World Health Organization (WHO) to support Member States in collecting information in order to assist them in their efforts to reduce the harmful use of alcohol, and its health and social consequences. The report was launched in Geneva on Friday 11 February 2011 during the first meeting of the WHO global counterparts for implementation of the global strategy to reduce the harmful use of alcohol. For the first time, delegations from all 193 Member States of World Health Organization (WHO) reached consensus at the World Health Assembly on a global strategy to confront the harmful use of alcohol. Since 2008, WHO has been in the process of drafting a global strategy to reduce the harmful use of alcohol. On Friday 21 May 2010 the Sixty-third session of the World Health Assembly adopted by consensus resolution WHA63.13, which endorses the global strategy. In September 2006, the Member States of WHO’s Western Pacific Regional Committee unanimously endorsed a Regional Strategy to Reduce Alcohol-Related Harm. The “Resource Book” is a tool to assist in translating the Regional Strategy into appropriate action at national and local community levels. The purpose of this book is to assist government agencies and ministries, in collaboration with nongovernmental agencies and organisations, to develop country level national alcohol policy and action plans. Alcohol-attributable injuries are of a growing concern to the public health community, with alcohol-related injuries such as road traffic accidents, burns, poisonings, falls and drownings making up more than a third of the disease burden attributable to alcohol consumption. This publication synthesizes results of a number of hospital emergency department studies conducted in different cultural and health care settings, including the WHO Collaborative Study on Alcohol and Injuries. It provides an introduction to the epidemiology of alcohol related injuries and refers to methodological issues of emergency department studies. It addresses public policy implications and equips the reader with practical information on interventions that can be implemented in emergency departments, such as screening and brief interventions for hazardous and harmful drinking. This Strategy focuses on reducing the harmful use of alcohol, in particular its impact on public health and welfare. It has been developed on the basis of a review of the literature on alcohol-related harm, experiences from countries and areas within the Region, and consultations with technical experts and other stakeholders, such as nongovernmental organisations and the alcohol beverage industry. It aims to provide guidance for action to reduce alcohol-related harm in Member States in the Western Pacific Region. Summary of the Report from the WHO Collaborative Study on Alcohol and Injuries. The project focused on eight countries from four continents (Belarus, India, Mexico, Kenya, Romania, the Russian Federation, South Africa and Zambia) and consisted of (1) a literature review carried out during 2002; (2) developing methodological premises for a field study aimed at complementing the literature data with up-to-date empirical findings (2002); (3) on-site research in the eight countries, yielding eight country reports (2002-2003); and (4) country-specific findings, which are the subject of this report. An international group of scholars analyzes the many sides of the problem of alcohol with a focus on Africa, Latin America, Asia, Oceania and indigenous societies within developed countries. The primary audience for which this book is written is those involved in dealing with alcohol problems in developing societies. This includes not only public health workers, law enforcement and public administration, but also policy-makers and concerned citizens. Download summary of the report here. Drawing on WHO’s global alcohol database, this report will provide an overview of the prevalence of drinking among young people, alcohol-related mortality and other health effects, trends in the alcohol environment surrounding youthful drinking, and prevention policies designed to reduce alcohol-related problems among the young. The purpose of this document is to provide guidance to WHO Member States on epidemiological monitoring in order to inform and facilitate effective policy formulation, and to improve the global and regional comparability of data on alcohol use and health consequences in order to improve monitoring and to facilitate research and risk assessment. It is intended to provide general principles and also practical guidance on the development of realistic and effective sets of indicators of alcohol consumption and harm for different countries with different levels of resources.